UConn Engineering was well represented during the Second Annual Celebration of Innovation, presented by the UConn Office of Economic Development on April 10th. The gala event (see event photos here) afforded the innovation community an opportunity to network and to celebrate the achievements of some of its most outstanding members. Read a related story here. Importantly, the event underscored the vital linkages among academic innovation, commercialization and economic impacts that benefit the State of Connecticut. According to Dr. Mary Holz-Clause, UConn’s Vice President of Economic Development, in the past year, UConn researchers have developed 80 new inventions and filed 42 U.S. patents, and the university has signed 10 license deals. Commercializing university innovations is a growing resource for the university that has generated $1.2 million in patent revenue alone in the past year. “UConn, thanks to the innovative research done by our faculty and students, is re-inventing industries and driving new innovations. The Celebration of Innovation is an opportunity to recognize the contributions the university is making in not only reshaping the state’s economy but also having a meaningful impact globally,” said Dr. Holz-Clause. Among the honorees were Dr. David “Ed” Crow, General Electric Corporation, and engineering faculty members who received U.S. patent awards in the last year. 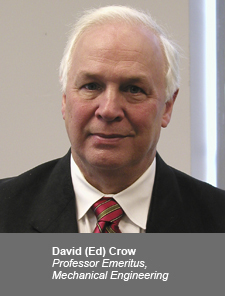 Dr. David “Ed” Crow, professor emeritus of Mechanical Engineering (2002-11) and a 36-year Pratt & Whitney employee, was honored with the Innovation Champions – University Employee Award. An elected member of the prestigious National Academy of Engineering, Dr. Crow has served as an outstanding role model throughout his engineering and academic careers. In 2011, he established the D.E. Crow Innovation Prize at UConn, which helps engineering students turn their entrepreneurial inspirations into marketable products through seed funding. Dr. Crow joined Pratt & Whitney in 1966 and rose to the position of Senior Vice President of the company’s Engineering, where he oversaw 6,600 engineers responsible for the design, development, validation and certification of all Pratt & Whitney large commercial engines, military engines and rocket products. Earlier, he served as Senior Vice President for the company’s Large Commercial Engines unit. He is a past secretary of the SAE, a member of ASME and AIAA, and an elected member of the University of Missouri-Rolla Academy of Mechanical Engineers and the UConn Academy of Distinguished Engineers. Earning the Collaborator of the Year Award, which is presented to a partner whose collaboration is likely to have a strong and lasting impact on the State economy, was General Electric Corporation. 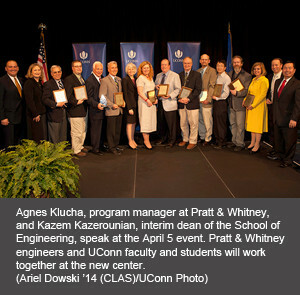 Last fall, GE Industrial Systems expanded its partnership with UConn Engineering through a five-year, $7.5 million investment that includes an endowed professorship, undergraduate scholarships, graduate fellowships, and $3.3 million in funding for company directed research at UConn, focused on electrical-protection technologies, including circuit breaker technologies. The investment brings together researchers from various academic disciplines and from the energy industry to conduct R&D on core electrical-protection technologies, including circuit breakers. Paul Singer, Technology General Manager of GE Industrial Systems, accepted on behalf of GE.